- Durable Melamine Laminate Surface. - All Tempered Safety Glass. - 34”H Front Viewing Area. - Adjustable 10” And 12” Glass Shelves. - Stain Finished Clear Anodized Aluminium Frame Extrusion. - Chrome Finished Standard And Bracket. - Aluminium Corner Base Protectors. - Bright White Finished Hardboard Sliding Doors. - And lock installed in rear white panel sliding doors. 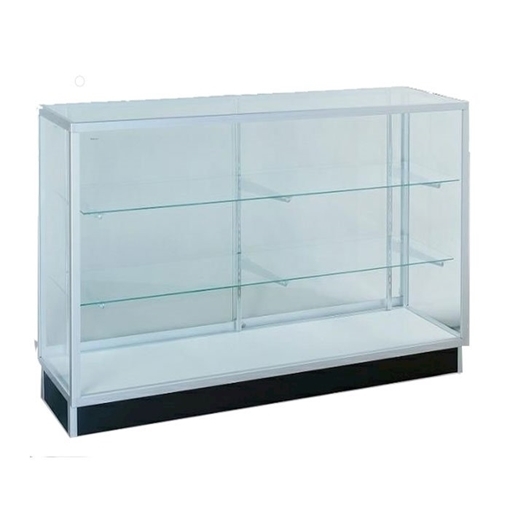 - Front opening corner cases have 2 adjustable glass shelves and front locking swing door. This Showcase is available in different lengths. Extra Vision Showcase Counter size: 48"L x20"Wx38"H. Weight: 150.00 LBS. Extra Vision Showcase Counter size: 60"L x20"Wx38"H. Weight: 170.00 LBS.